The subtle body in Indian mysticism, from a Yoga manuscript in Braj Bhasa language, 1899, now in the British Library. A subtle body is one of a series of psycho-spiritual constituents of living beings, according to various esoteric, occult, and mystical teachings. According to such beliefs each subtle body corresponds to a subtle plane of existence, in a hierarchy or great chain of being that culminates in the physical form. The subtle body (Sanskrit: sūkṣma śarīra) is important in several Indian religions such as Hinduism, Buddhism and Jainism, mainly in the forms which focus on Tantra and Yoga. According to Bhagavad Gita, one of the most sacred texts of Hinduism, the subtle body is composed of mind, intelligence and ego, which controls the gross physical body. In Buddhist Tantra, it is also called the ‘innate body’ (nija-deha) or the ‘uncommon means body’ (asadhdrana-upayadeha). Other spiritual traditions teach similar ideas of a mystical or divine body, such as: "the most sacred body" (wujud al-aqdas) and "true and genuine body" (jism asli haqiqi) in Sufism, the meridian system in Chinese religion, and "the immortal body" (soma athanaton) in Hermeticism. The various attributes of the subtle body are frequently described in terms of often obscure symbolism: Tantra features references to the sun and moon as well as various Indian rivers and deities, while Taoist alchemy speaks of cauldrons and cinnabar fields. An illustration of a subtle body system of seven chakras commonly adopted by contemporary yoga. The subtle body (linga), previously arisen, unconfined, constant, inclusive of the great one (mahat) etc , through the subtle elements, not having enjoyment, transmigrates, (because of) being endowed with bhavas ("conditions" or "dispositions"). As a picture (does) not (exist) without a support, or as a shadow (does) not (exist) without a post and so forth; so too the instrument (linga or karana) does not exist without that which is specific (i.e. a subtle body). The classical Vedanta tradition developed the theory of the five bodies into the theory of the koshas "sheaths" or "coverings" which surround and obscure the self (atman). In classical Vedanta these are seen as obstacles to realization and traditions like Shankara's Advaita Vedanta had little interest in working with the subtle body. In Tantra traditions meanwhile (Shaiva Kaula, Kashmir Shaivism and Buddhist Vajrayana), the subtle body was seen in a more positive light, offering potential for yogic practices which could lead to liberation. Tantric traditions contain the most complex theories of the subtle body, with sophisticated descriptions of energy nadis (literally "stream or river", channels through which vayu and prana flows) and chakras (lit. "circles") which are points of focus where nadis meet. The main channels, shared by both Hindu and Buddhist systems, are the central (in Hindu systems: susumna; in Buddhist: avadhuti), left and right (in Hindu systems: ida and pingala; Buddhist: lalana and rasana). Further subsidiary channels are said to radiate outwards from the chakras, where the main channels meet. 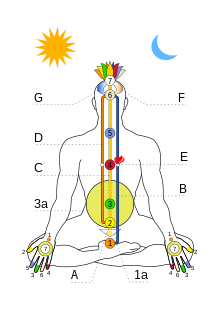 There are various chakra systems depending on the tantra; the Netra tantra describes six chakras, the Kaulajñana-nirnaya describes eight, and the Kubjikamata Tantra describes seven (the most widely known set of chakras). The modern Indian spiritual teacher Meher Baba stated that the subtle body "is the vehicle of desires and vital forces," He held that the subtle body is one of three bodies with which the soul must cease to identify in order to realize God. 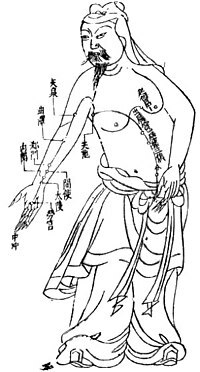 A Tibetan illustration of the subtle body showing the central channel and two side channels as well as five chakras. The subtle body consists of thousands of subtle energy channels (nadis), which are conduits for energies or "winds" (lung or prana) and converge at chakras. According to Dagsay Tulku Rinpoche, there are three mains channels (nadis), central, left and right; "their beginning point is located between a person's eyebrows. From there, they run upward to the crown chakra. The passage then parallels the spine, running through all seven chakras - the centers of subtle energy - and ending about two inches below the belly button." In the Center [i.e. cakra] of Creation [at the sexual organ] a sixty-four petal lotus. In the Center of Essential Nature [at the heart] an eight petal lotus. In the Center of Enjoyment [at the throat] a sixteen petal lotus. In the Center of Great Bliss [at the top of the head] a thirty-two petal lotus. In contrast, the historically later Kalachakra tantra describes six chakras. In Vajrayana Buddhism, liberation is achieved through subtle body processes during Completion Stage practices such as the Six yogas of Naropa. During incarnated existence, these are ruled by Manas - the human mind, which is dual in nature and which provides the link between the deathless, immortal Monad above and the transitory vestures of incarnation. Lower manas is linked with the Sukshmopadhi in the Raja Yoga system or the Human Soul in the Theosophical conception. It allows for reason, judgement and choice in contact with the lower planes of earthly life. Manas is however, also potentially the vehicle of the Higher Mind, called Buddhi-Manas or "the Causal Body (the United 5th and 6th principles)" when not drawn downwards by identification with the transitory personality, by personal desires and afflictive emotions, "the more intimate astral." The Linga Sharira is the invisible double of the human body, elsewhere referred to as the etheric body. It is the astral or "design" body which serves as a model or matrix for the physical. The linga sarira is connected with the capacity for clairvoyance and clairaudience and for much of the psychic phenomena which is currently unexplainable by modern science and psychology. Among it's many unknown features and capacities, it can be separated or projected a limited distance from the body. When separated from the body it can be wounded by sharp objects. When it returns to the physical frame, the wound will be reflected in the physical counterpart, a phenomenon called "repercussion". At death, it fuses with kama and the lower elements of the terrestrial mind (called lower manas) and depending upon the severity of its earthly attachments, slowly disintegrates or decomposes. While in various stages of disintegration, it forms the post-mortem Kama-rupa, a disintegrating, soul-less and conscience-less entity which can under certain conditions appear in seances and is the source of "spooks", "shells" or apparitions of the dead. It is for this reason that Blavatsky condemned the practice of attempting to evoke or arouse the presence of deceased persons through mediums, psychics or other means. Each "body" was given its own aura and set of chakras. The later Theosophical arrangement was taken up by Alice Bailey, and from there found its way (with variations) into the New Age worldview. It is also associated with the human aura observed through Kirlian photography and Kilner screens. The anthroposophical view of the human being found in Rudolf Steiner's Anthroposophical teachings usually referred to only the Etheric and Astral Bodies. However, Steiner also used a threefold classification of body, soul, and spirit as well as a sevenfold and a ninefold description. Max Heindel divided the subtle body into: Vital Body made of Ether, our instrument for specializing the vital energy of the sun, seen by clairvoyant vision to extend about an inch and a half outside the body; the Desire body, which is our emotional nature and pervades both the vital and dense bodies, seen by clairvoyant vision to extend about 16 inches outside our visible body, related to the Desire World; and the Mental body, which functions like a mirror, reflects the outer world and enables the Ego to transmit its commands as thought, word and action. The human being is seen as a threefold Spirit, possessing a Mind by which he governs the threefold Body that he transmutes into a threefold Soul. The Human Spirit aspect has emanated from itself the desire body to be transmuted into the Emotional Soul; the Life Spirit aspect has emanated from itself the vital body to be transmuted into the Intellectual Soul; the Divine Spirit aspect has emanated from itself the dense body to be transmuted into the Conscious Soul. Samael Aun Weor wrote extensively on the subtle vehicles, organizing them in accordance with the kabbalistic Tree of Life. The common person only contains the lunar vehicles of emotion (astral body), thought (mental body), and will (causal body), concentrations of the collective animalistic intelligence, the evolution of the Essence through the mineral, plant and animal kingdoms. Becoming human means to have a soul, a Solar Astral Body, Solar Mental Body and Solar Causal Body. These bodies are constructed through a form of Tantra called White tantrism. Barbara Brennan's account of the subtle bodies in her books Hands of Light and Light Emerging refers to the subtle bodies as "layers" in the "Human Energy Field" or aura. Causality proceeds downwards: each of the layers has its own characteristics and can have its own expression of disease, requiring individual healing. As with the Adyar arrangement, each body or aura also has its own complement of chakras, which interrelate to those in the other layers. An interesting variant on the concept of subtle bodies is found in both Alchemical Taoism and the "Fourth Way" teachings of Gurdjieff and Ouspensky, where it is said that one can create a subtle body, and hence achieve post-mortem immortality, through spiritual or yogic exercises. The "soul" then is not something one is born with, but something that one has to develop through esoteric practice. According to (Rosenthal, 1997) "In Gurdjieff's cosmology our nature is tripartite and is composed of the physical (planetary), emotional (astral) and mental (spiritual) bodies; in each person one of these three bodies ultimately achieves dominance." The Fourth way as taught by Gurdjieff and Ouspensky is a philosophy of developing the divine body which is gained when one has complete understanding and self perfection. The ultimate task of the fourth way teachings is to harmoniously develop the four bodies into a single way. The work of the Body of Light was part of English author and occultist Aleister Crowley's system of magick, saying in his Magick (Book 4) that it must be developed by rigid discipline, including rituals and the "assumption of god-forms", as well as by practice and experience. One passes through the veil of the exterior world (which, as in Yoga, but in another sense, becomes "unreal" by comparison as one passes beyond) one creates a subtle body (instrument is a better term) called the body of Light; this one develops and controls; it gains new powers as one progresses, usually by means of what is called "initiation:" finally, one carries on almost one's whole life in this Body of Light, and achieves in its own way the mastery of the Universe. ^ pnd (15 July 2011). "Bg 13.6-7". www.vedabase.com. Archived from the original on 3 May 2018. Retrieved 3 May 2018. ^ a b c Wayman, Alex; Yoga of the Guhyasamajatantra: The arcane lore of forty verses : a Buddhist Tantra commentary, 1977, page 65. ^ a b c Geoffrey Samuel, Jay Johnston (editors). Religion and the Subtle Body in Asia and the West: Between Mind and Body, Routledge, 2013, p. 33. ^ a b Geoffrey Samuel, Jay Johnston (editors). Religion and the Subtle Body in Asia and the West: Between Mind and Body, Routledge, 2013, p. 34. ^ Samkhyakarika, transl. Gerald Larson, vv 60-81, Classical Samkhya p.268. ^ Baba, Meher (1967). Discourses. 2. San Francisco: Sufism Reoriented. p. 145. ISBN 978-1880619094. ^ Baba, Meher (1967). Discourses. 2. San Francisco: Sufism Reoriented. p. 144. ISBN 978-1880619094. ^ Geoffrey Samuel, Jay Johnston (editors). Religion and the Subtle Body in Asia and the West: Between Mind and Body, Routledge, 2013, p. 40. ^ Geoffrey Samuel, Jay Johnston (editors). Religion and the Subtle Body in Asia and the West: Between Mind and Body, Routledge, 2013, p. 38. ^ Samael Aun Weor. "Types of Spiritual Schools". Archived from the original on 31 May 2007. Note: The "ego" referred to by Samael Aun Weor is not used in the same context as it is used other esoteric schools. Sheila Ostrander and Lynn Schroeder Psychic Discoveries Behind the Iron Curtain, Englewood Cliffs, New Jersey: Prentice Hall, 1970. Samael Aun Weor, The Perfect Matrimony or The Door to Enter into Initiation. Thelema Press. (1950) 2003. Samael Aun Weor, The Esoteric Course of Alchemical Kabbalah. Thelema Press. (1969) 2007. Crowley, Aleister (1997). Magick (Book 4) 2nd ed. York Beach, Maine. : Samuel Weiser. Thelemapedia. (2004). Body of Light. Retrieved April 16, 2006. White, John. Enlightenment and the Body of Light in What is Enlightenment? magazine. James L. Oschman. Energy Medicine: The Scientific Basis. Paramahansa Yogananda, Autobiography of a Yogi, Los Angeles, CA: Self-Realization Fellowship, 1946, Chapter 43.